There is nothing like brunch. I can’t tell you how I look forward to waking up to a steaming cup of chai tea sweetened with honey and milk and spend some leisurely time making brunch. It’s my Sunday morning ritual….when life allows. Most recently, I made something so simple, so delicious, it’s the stuff dreams are made of. At least my dreams. 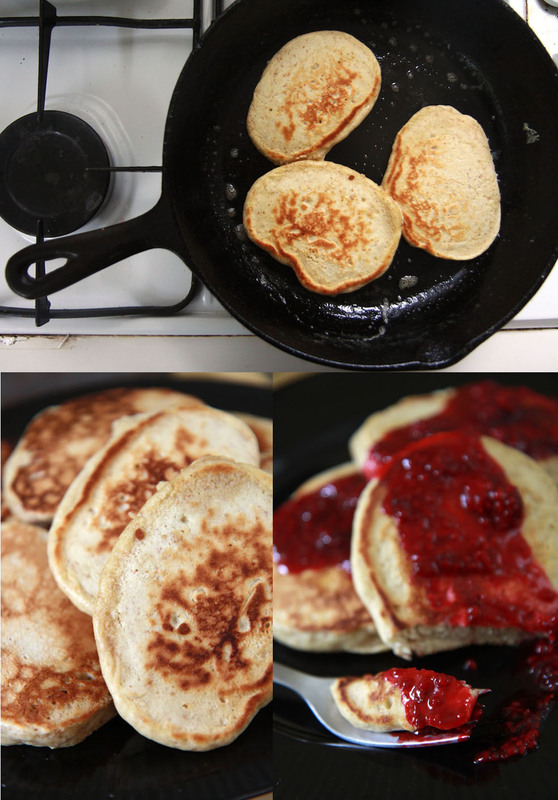 Whole Grain Pancakes with Blackberry Compote. Not to mention, blackberries I had picked on a hike only one hour earlier. Pair it with a simple fruit on the side, like fresh mangos tossed with shredded coconut and lime juice, and you’ve got pure goodness. I have had many a’pancake in my lifetime. Some thin, some thick, some dense, some fluffy, some bland, some just perfect. 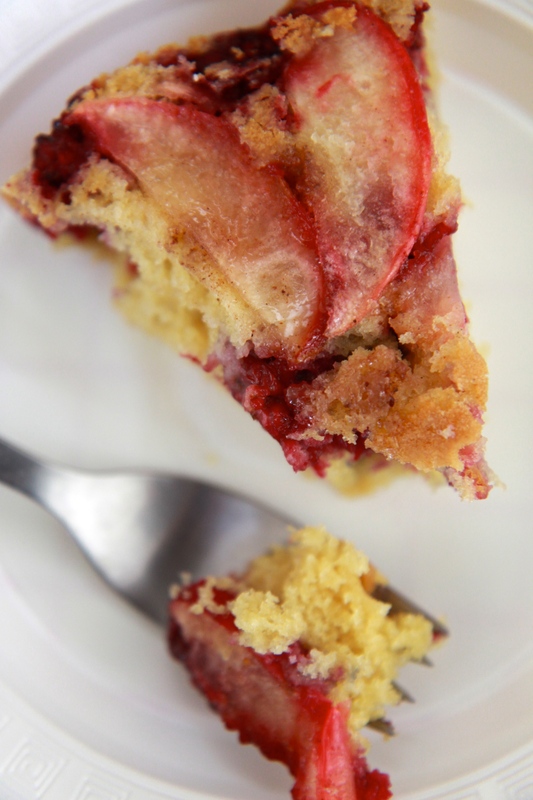 And these, I have to say may be absolutely perfect…the perfect balance between flavor, fluffiness and texture. And there’s a healthy side to them -whole grain. Pancakes, in general, require very special treatment and lots of care during the pancake-making process. They are delicate and cannot be left alone too long. Ideally, pancakes are made in cast-iron skillets. A well-seasoned skillet will yield a perfect pancake that is slightly golden brown, crispy on the outside, soft on the inside, and makes your mouth water, and your eyes roll back and gently close in complete and utter satisfaction. When cooking pancakes, a low-medium heat is best. It will allow the pancakes to cook evenly inside and out and create a nice golden surface. Okay, okay, enough talk. Pancakes are JUST. PLAIN. GOOD. 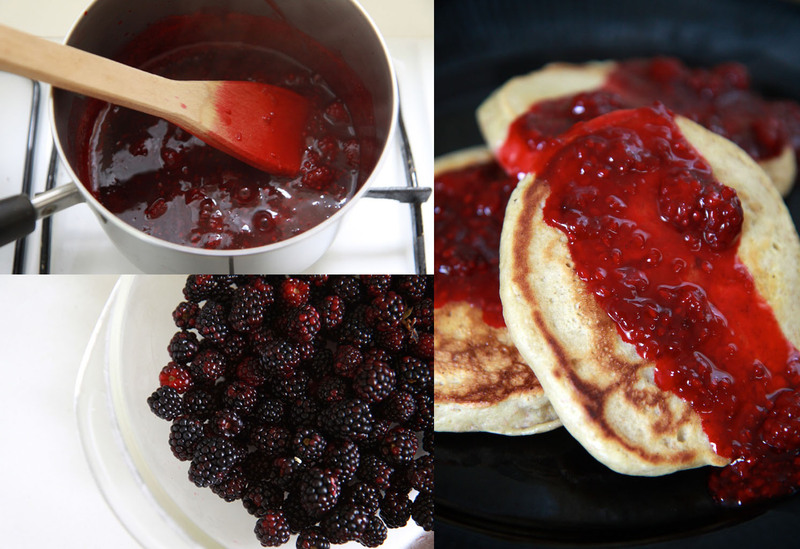 To make the blackberry syrup, put the blackberries, the sugar, honey or maple syrup, water and citrus in a medium saucepan over medium-low heat. Heat and stir until the sugar dissolves, simmering for 5 to 6 minutes or until the blackberries break down and become sauce-like. Remove from heat to cool slightly. In a separate bowl, combine the flour, baking powder, baking soda, sugar, and salt. Add the buttermilk, eggs, and melted butter. Stir all the ingredients until they are just combined. Leave the batter slightly lumpy, as you don’t want to over mix. Heat your skillet to a low-medium with a bit of butter. Pour about 1/3 of a cup of batter into the skillet. Wait until the pancake bottom is deep golden in color and the top has formed slight bubbles, then flip with a spatula and cook the other side until golden and cooked through. Repeat with the remaining batter. Pour the compote on top of warm pancakes and revel in epicurean heaven. Compote is great left-over on toast, ice cream, yogurt, you name it. The best thing about living in Costa Rica is the abundance of fruit year-round. And in this zone, more so than in other parts of Costa Rica. 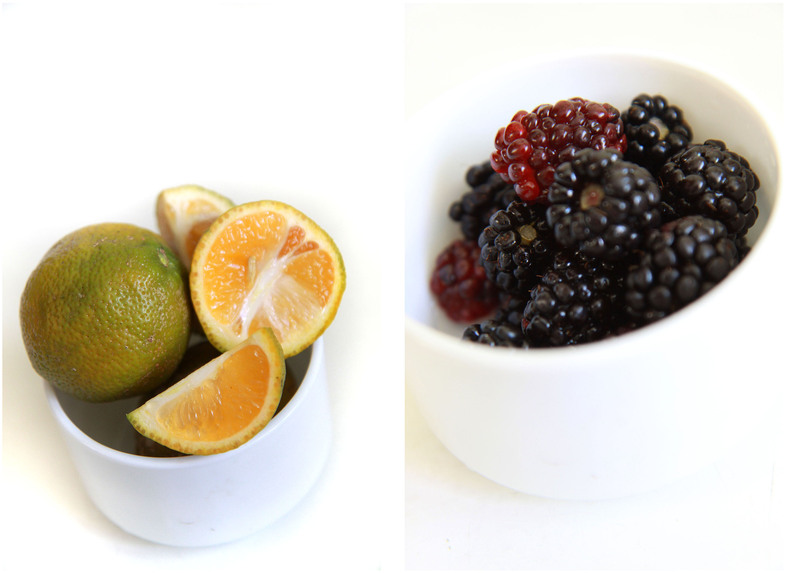 Apples, peaches, plums, blackberries, avocados, tomatoes – you name it, they’re almost always available. As I was out tromping around my property this morning, I came across a previously undiscovered blackberry bush, chock full of large, plump, juicy blackberries just waiting to be picked – screaming to be picked, in fact. And so I did. The thorns poked my hands and arms as I reached in deeper to get the hidden ones, and I came away with violet-stained fingers. But I didn’t mind. It was worth it. On the way in I quickly grabbed a few ‘limón acidas‘ or limes to garnish a salad. Earlier that morning I passed by my neighbors’ house who own Las Manzanas Cabins to purchase a bag of organic apples, some avocados, and some anonas all for only two dollars. 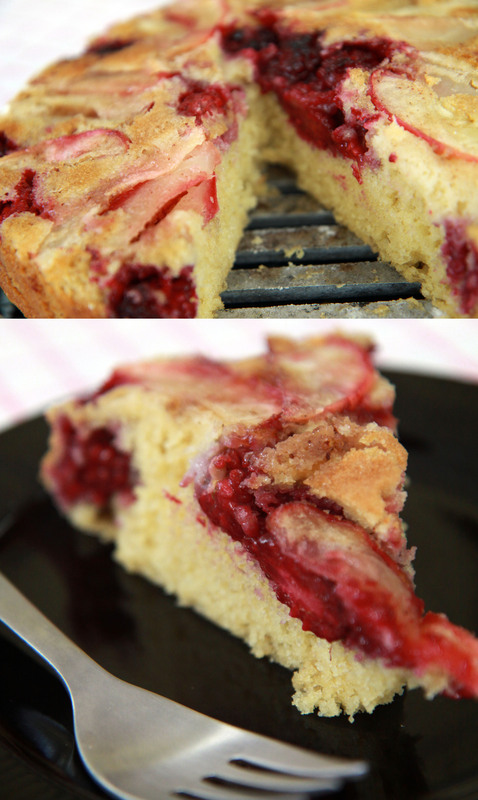 Upon returning home, it wasn’t too long before I was enjoying this cinnamon apple and blackberry upside down buttermilk cake. Pure goodness with fresh, local ingredients. Happy 2010 to you all! May many healthy meals come your way! 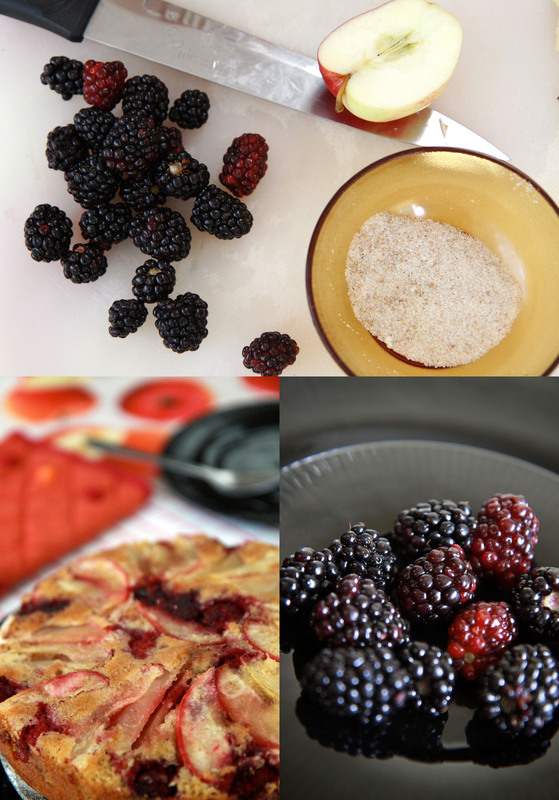 Arrange blackberries and apples in 1 layer in cake pan. Sprinkle fruit with 1 1/2 tablespoons sugar/cinnamon mixture and shake pan to help distribute sugar. Whisk together 1 cup flour, baking soda, and salt in a bowl. Beat together butter and remaining 1/2 cup sugar in a large bowl with an electric mixer at high speed until light and fluffy, about 2 minutes. Add egg and vanilla and mix at low speed until just incorporated. Alternately add flour mixture and buttermilk in 3 batches, mixing at low speed until just incorporated. Spoon batter evenly over berries, smoothing top, and bake in middle of oven until top is golden and a tester comes out clean, 30 to 35 minutes. Run a thin knife around edge of pan, then invert a large plate over pan and, using pot holders to hold plate and pan together tightly, flip cake onto plate. Peel off parchment and serve cake warm and/or with ice cream.